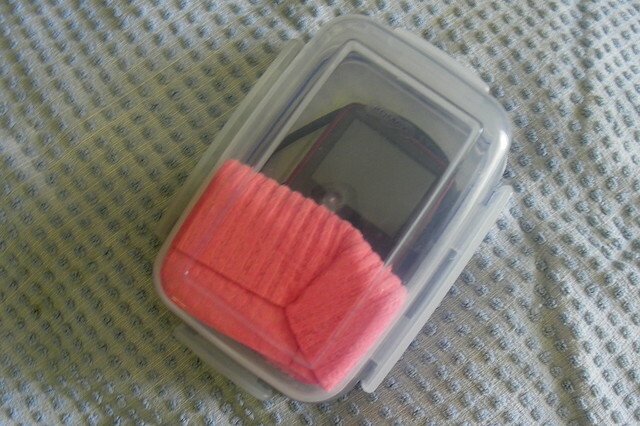 In yet another photography related post I am going to describe how I made an improvised underwater housing for my Kodak Zx1 pocket video camera. It cost me less than €10 to make and, although it is not going to give serious filmmakers any sleepless nights, it did allow me to get some fun shots of the kids snorkeling in Comino’s Blue Lagoon. Check out my first underwater video …..
My Kodak Zx1 camera is weatherproof/splashproof but certainly not designed to be submerged in water. I bought a rectangular lunchbox (the sort with 0-ring type seals) which was just big enough to house my Kodak. The plastic bottom of the box was translucent but not properly transparent so I cut a hole and used Araldite epoxy resin to glue on a piece of clear plastic from the top of a Pringles snack tube. I figured that even though it was not ‘optical glass’, it would probably give me the same sort of view as peering through a steamed up snorkel mask. I was right. 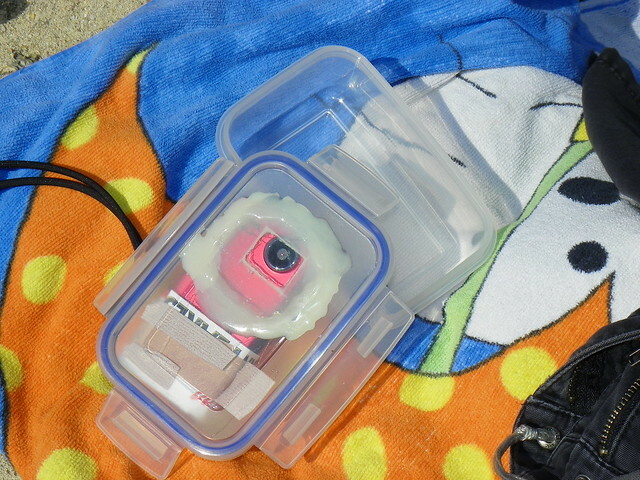 I wedged the camera into the box with a dishwashing sponge, figuring that in the (highly probable) event of a leak, the sponge would absort some of the sea water and give me enough time to get the camera out of the water. As it turned out I needn’t have worried as the housing proved pretty watertight. One of the main drawbacks of my DIY housing was the fact that I had absolutely no access to the camera controls. I had to open the housing to start and stop recording. Another difficulty was with the viewfinder which was very tricky to see underwater. As you can see in the video, my framing was rather hit and miss! 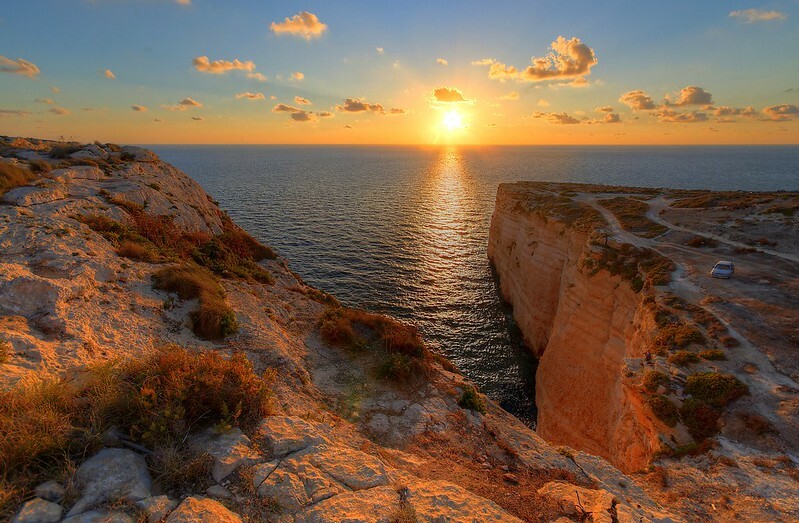 If you want to get off the beaten track in Malta, and are prepared to swap your flip flops for walking shoes, you will experience a side of Malta that most tourists never see. To point you in the right direction, the Malta Tourism Authority have published a great series of countryside walk guides which can be downloaded for FREE from www.visitmalta.com. One hot Saturday in June 2010 I got off the bus in Ghadira armed with bottled water, cameras, tripod and a printed copy of the Marfa Ridge Walk brochure. It was a very hot day and the German football team were meeting Argentina in the World Cup quarter final later that afternoon so I figured that I would follow the the walk for a couple of hours and then find a bar with a big TV to watch the match. I left the beach at Ghadira, packed as it always is in the summer with a mix of tourist families, language students and a few brave locals, and walked up onto the northern part of the Marfa ridge. The road is quiet and bordered by scrubby trees. Clumps of wild thyme and straggly fennel bushes are everywhere and give up a delicious fragrance if you crush the leaves or seeds between you fingers. To the right of the road, dusty paths lead to low cliffs and great views of the bay. This HDR shot was taken about halfway down the ridge. Further down the road, past one of Malta’s few camp sites, the trees thin out. 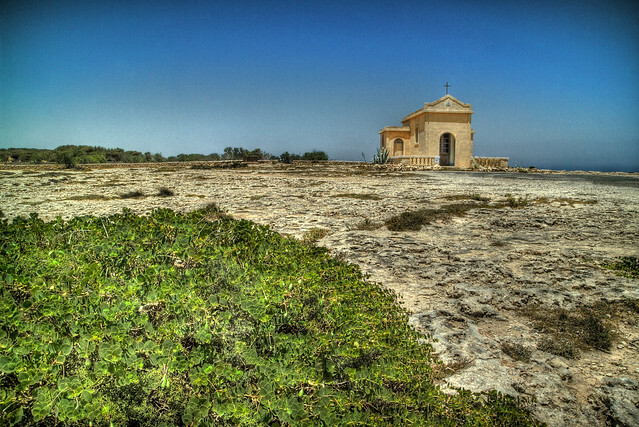 The Immaculate Conception chapel stands at the end of the headland. Close by, rather close to the cliff edge is a statue of Our Lady. After checking out the chapel I set off towards the white tower and pretty much the most northerly point of mainland Malta. 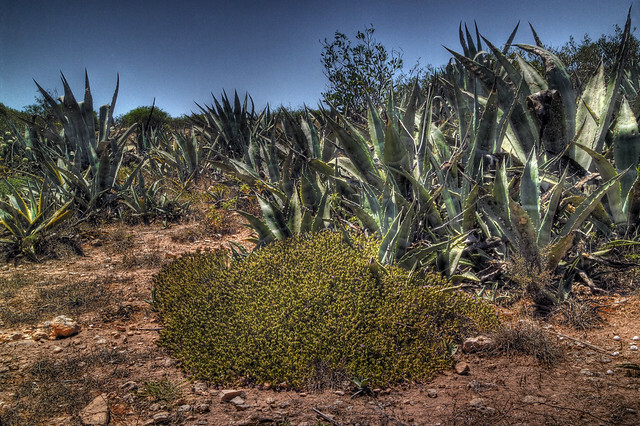 On the way I passed through areas where swathes of jagged agave plants compete for space with the wild thyme bushes. If you are doing the walk with bare legs, give them a wide berth or you will find out just how prickly these plants are. From the agave bushes I continued down the hill and eventually came to the campsite entrance. I turned right here and walked up the rocks towards a very large radio antennae. Just behind the fenced off area is a large depression where the rocks have fallen in to leave a crater that is open at one end to the sea. Here at Ahrax Point you have excellent views of Comino and Gozo. I sat on the rocks for a while and watched a variety of craft ranging from ferries to jetskis making their up and down the Comino Channel. By now I was beginning to think of a beer and the football match so I headed back up to the ridge road by way of Little Armier Bay. The Malta Tourist Authority walk continues for a couple more hours on the southern part of the Marfa Ridge. I will save that for my next visit. UPDATE: The Geocache itself has been removed several times by vandals and the treasure is no longer in it’s hiding place. You may be able to find a slightly modified version of this cache on geocaching.com (thank you Veronika). If you still want to do the treasure hunt, all of the clues are still valid and (I think) that it is an interesting walk. Please feel free to let me know where you ended up and I will let you know if you were on the right track! Geocaching is an increasingly popular pastime. It involves hiding a small container of ‘treasure’ and then providing either the GPS coordinates directly, or (as in this example), a number of clues to enable the treasure hunter to work out the coordinates for themselves. Once found, the finder usually enters some remarks in a log book, sends the owner of the’geocache’ an e-mail, registers the find on a web site etc. Typically, the finder replaces one of the fun ‘treasure objects’ with an item of their own. This cache was hidden in August 2009. Give it a try. Hopefully it will be fun whether you are a tourist or a local. You should plan at least ninety minutes to do the whole thing. There is bit of walking involved so if you are attempt the cache in the summer months, you might prefer to avoid the heat of the midday sun. 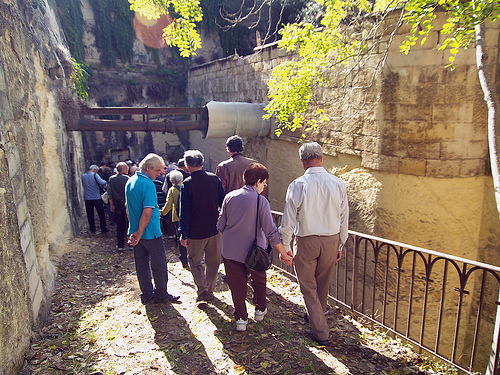 We start in the Upper Barraka Gardens with a fantastic view of the historic Grand Harbour. 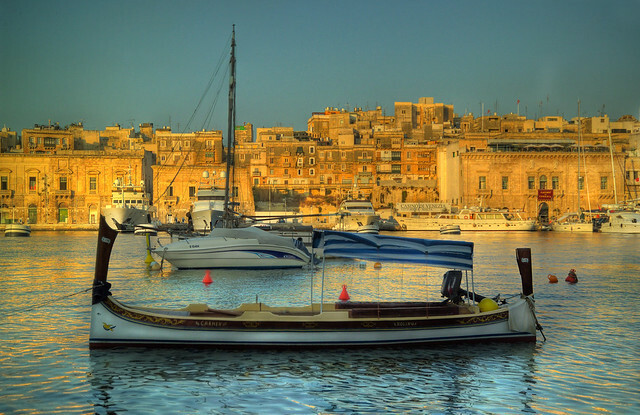 Look out over the creeks and the three cities of Vittoriosa, Senglea & Cospicua and imagine what they must have looked like crammed with British warships and merchantmen. In the closing years of the 19th Century, Britain had and Empire and, believe it or not, the tiny island of Malta had a railway! It ran from Valletta to Mdina and was known locally as Xmundifer (a delicious corruption of Chemin de Fer – in Maltese the letter X is pronounced SH). The Malta railway is going to provide the loose theme for this cache. Directly below you as you look out over the harbour is the Saluting Battery. If you are here at mid day you will be treated to a salvo from the ceremonial canon. How many canon can you see? As this is the first question, I’ll give you a hint…. Do not be too hasty. You might need to lean over the railings a bit to make sure you don’t miss anything (be careful though). 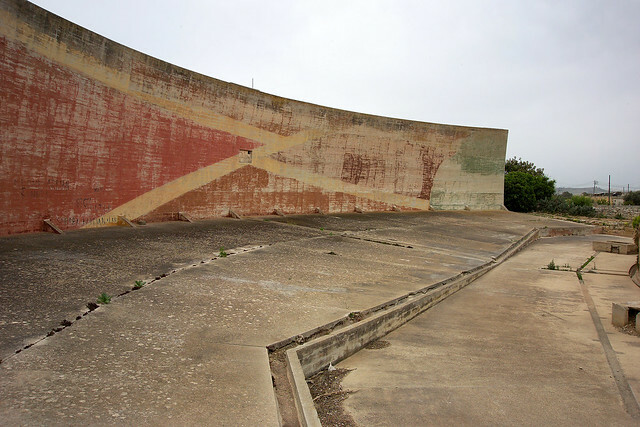 Answer A: There are ____ canon on the saluting battery. 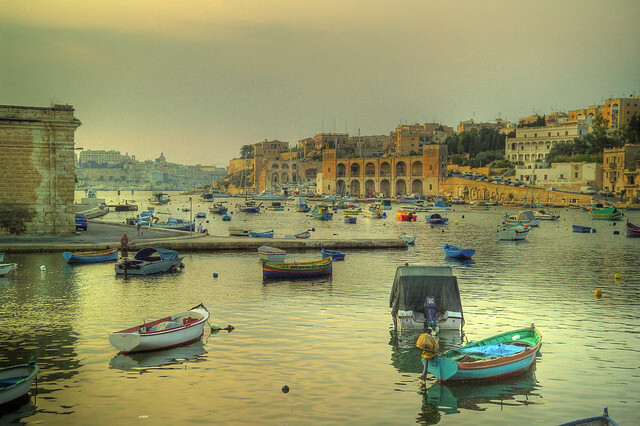 Once you have had your fill of views of the Grand Harbour (will you ever have enough? ), leave the Upper Barraka Gardens, and cross the road so that you are in front of the ‘Auberge de Castille’. There are two canon on the steps of the Auberge. Directly in front of the building is a roundabout (a traffic circle if you are from the USA). The roundabout is a miniature botanical garden with scores of chilli pepper plants scattered amongst date palms. The second question concerns the number of palm trees that are planted around the circumference of the roundabout. Answer B: There are ____ palm trees planted around the circumference of the roundabout. 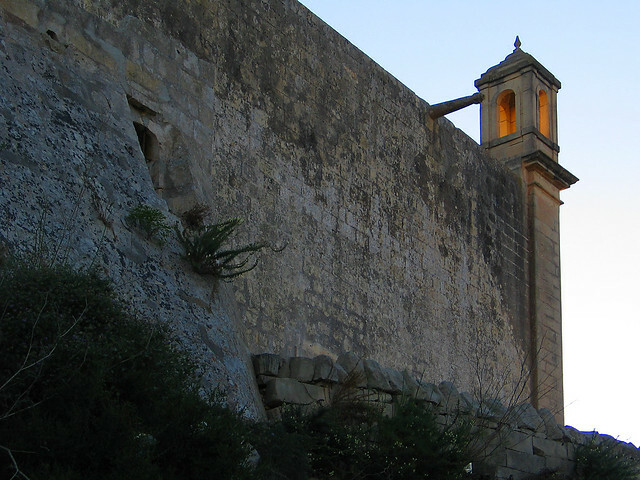 From the ‘Auberge de Castille’, walk down the slope and pass the police station on your right hand side. In front of you are the remains of a large building that was destroyed by AXIS bombers during the second world war. The ruins remind us of the dark days when the area around the Grand Harbour was the most heavily bombed place on earth. The third question is a multiple choice. If you don’t know the answer, ask one of the locals – they are quite friendly! Now make your way across the square towards Valletta City Gate and, if you are interested, make a short detour to seek out the site of the old railway station (you can skip this bit if you are in a hurry as there are no clues there). Next to the Tourist Information office you will find a flight of stairs leading down to the ‘Great Ditch’ that separates Valletta from Floriana. Ignore the faint smell of urine and make your way to the bottom where you will find a car repair workshop in tunnel that was the original station. The small steam trains crossed the ditch on a small viaduct before entering a longer underground section taking them underneath the bus terminus on their way to Floriana station. Take a deep breath and go back up the stairs. Leave Valletta via the city gate and look out across the bus terminus. In the center is the famous Triton Fountain which may or may not be working when you visit. Count the number of figures supporting the massive bowl. On the other side of the roundabout you will see the shining gold top of the Royal Airforce Memorial. Make your way towards it but be very careful of the buses. A few meters past the memorial is a huge underground car park which I believe bisects the original railway tunnel. In front of you now you can see the church of St Publius, named after the Roman Governor of Malta who was converted to Christianity in AD60 by none other than St Paul following his well documented shipwreck (Acts. Chapter Verse) on the northern coast of Malta. In front of the church is a large square which covers a network of underground granaries (more of this later). To the right of the church from your viewpoint, is a long garden – the ??? gardens also called ‘the Mall’. Make your way to the ‘Indipenza’ statue just outside and to the north of the Mall. Check the inscription on the statue and make a note of all three parts of the date that Malta became independent. The railway tunnel runs somewhere under the Mall gardens but there is no access (that I know of). Various prominent Maltese citizens are commemorated along the central area of the gardens. Look for the bust of Sir Hannibal Scicluna, one of Malta’s most emminent (and probably oldest) Historians. Subtract his year of birth from his year of death (which may or may not equal his age) to arrive at the answer for the next question. The inscription on the plinth is a little faint so please look carefully. I had to step into the flower beds to get a clear look. Leave the Mall gardens by one of the side exits and cross over into the square in front of St Publius’. The large stone blocks that you see are actually the covers to the grain stores. How many covers are there in all? Take care because not all rows contain equal numbers of covers. I had to count them several times before coming up with a consistent answer! 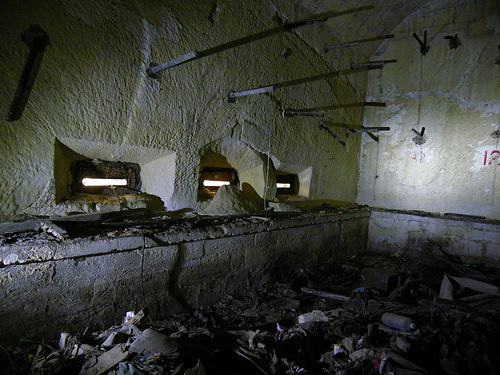 Answer I: There are ____ stone blocks covering the grain stores. Now for the final section of our journey, it is a bit of a walk (perhaps 10 minutes) so gather your strength and walk down Sarria Street past the church (on your right) and make your way to the end. Floriana station used to be somewhere here but the building was demolished relatively recently (perhaps in the late 1990s?). Who knows what remains of the underground part. 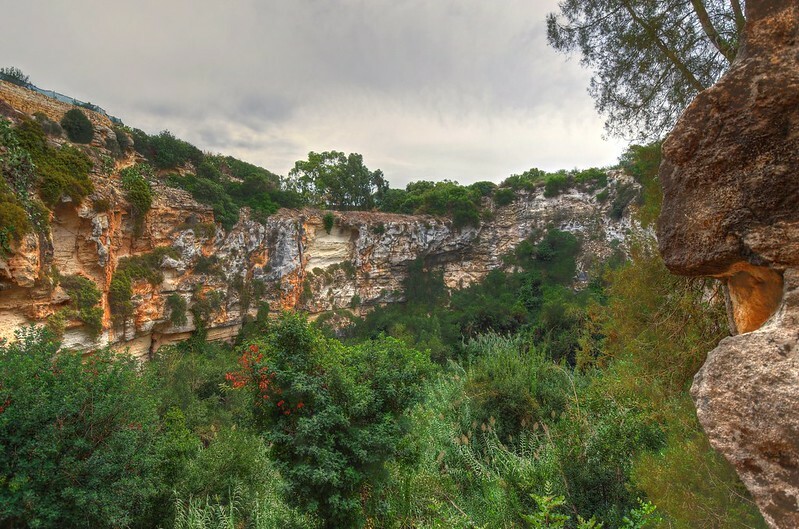 At the top of the road you will reach the very impressive Argotti Botanical Gardens. Definitely worth a visit if you are at all horticulturally inclined. There is also a reasonably presentable public toilet. For the purposes of our little adventure, let’s assume you don’t need the toilet and that you will visit the gardens another time. Sarria street makes a 90 degree turn to the left. Follow it down hill to where it meets the very busy main road (Triq Sant Anna). Turn right and walk for a few more minutes until you see the ‘Porte de Bombes’ straddling the road. Traffic in and out of Floriana passes under or around this gate. How many arches does it have. 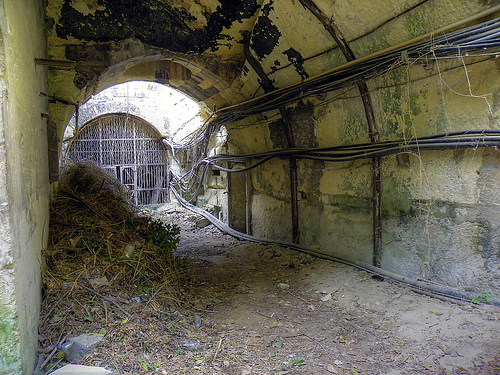 Answer J: The Porte de Bombes has ____ arches. So, you have answered all of the questions. Now you need to turn the answers to the questions into GPS coordinates to be able to find the cache…. That’s it! If you find the cache, please replace it as you found it an please post a comment here. If you have any trouble, or find that the cache has been damaged, please also post a short message. You can read messages from people who have already found the cache at geocaching.com. In 2005 I made a DVD of Malta from the air. It took me about a year to do the filming from microlight aircraft from the Malta Microlight club and editing . I sold about 1000 copies on the internet and through staitioners and souvenir shops in Malta. I was pretty pleased with the results but looking at the video now ten years later, I must admit that it looks a bit ‘tired’, especially compared to HD footage from modern camera drones! If you can’t wait to see “Malta by Microlight – an aerial adventure”, I have put it on YouTube for your viewing pleasure. Scroll to the bottom of this post for the links. If you haven’t already seen what is possible with the current generation of drones, do a quick search on YouTube or Vimeo for “aerial videos” and you will be amazed! If you are good with your hands, you can put together a drone from a kit for something less than 500€ plus the camera. A plug and play drone with a built in camera can be had for about twice that. I took the plunge earlier this year and bought a DJI 450 Flame Wheel kit from the DJI online shop. It cost about 219€ and came with the frame, flight controller (autopilot), motors, propellers, GPS antenna/compass, speed controllers and all of the screws and other bits and pieces required to put it together. Not included was the radio transmitter and reciever, batteries, camera (I already have a GoPro) or the gimbal to stabilize the camera. It really was very simple to put the basic quadrocopter together. Some soldering was required but nothing too fancy. 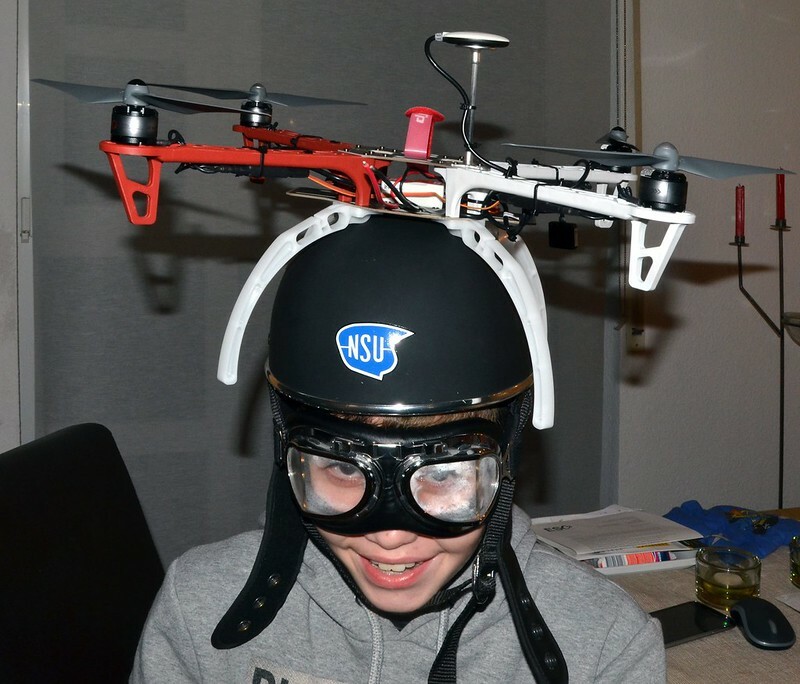 After a couple of evenings I was ready for a test flight with my son Sam at the controls…. Only joking! After signing up for the obligatory 3rd party insurance, my first flights were made in the snowy fields behind my house and I soon found that it was VERY easy to get some amazing shots with relatively little effort! I am not going to go into the details of how to fly a drone here. It is really not that difficult and there is masses of information on the internet written by people much better qualified than I am. The main thing to remember is to be sensible about where you fly. Check the local rules. Don’t fly too close to people. Don’t fly close to airports. Don’t fly too high (the maximum legal height varies by country but it is typically around 100 metres). Anyway, enough of the boring stuff. Late September 2015 I packed my drone in a suitcase and headed off for a long weekend in Malta. This is the video I shot…. HDR Photography – an interesting way to spice up your travel pictures. Over the last year or so, I have been seeing increasing numbers of HDR (High Dynamic Range) images on blogs and photo sharing sites. HDR images are made by using special software to merging several differently exposed images together into a single image. 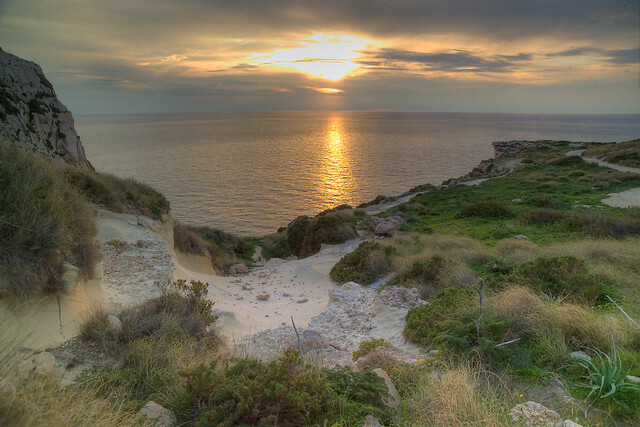 On recent trips to Malta I have been trying my hand at HDR photography and I am going to share some of the resulting pictures with you here. A single camera exposure is usually made to show good detail in the main subject regardless of whether the highlights burn and the shadow areas block up. We don’t have any other option but to expose for the area of the scene that we are most interested in. In real life we have the luxury of being able to widen our pupils to peer into shadows or to screw up our eyes to look at brighter parts of the scene. HDR photography mimics this real life behavior by taking separate images to capture shadow, mid tone and highlight detail before combining them into a single image. I used Photomatix software to do the clever stuff. Do some Googling to find out more about the technique. In the meantime, here are some of the images that I took. 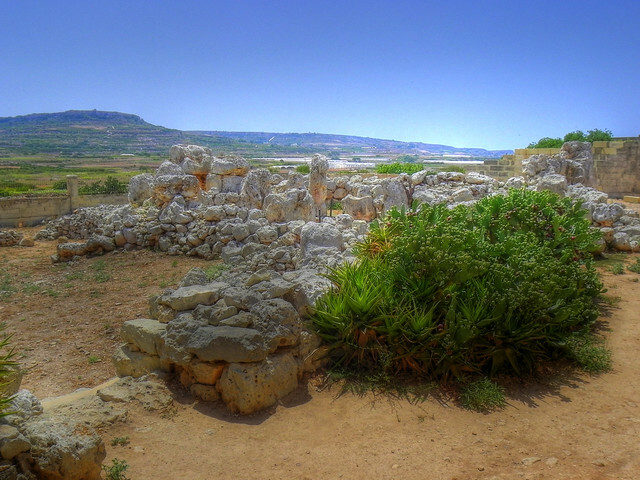 Starting near Mgarr, the first shot is of the Ta Hagrat Neolithic temples. They are smaller than the more famous sites at Hagar Qim, Mnajdra, Ggantija & Tarxien but are definitely worth a visit if you are in the area. They are only open to the one day a week (I think) but you can get a reasonable shot of them through the fence. 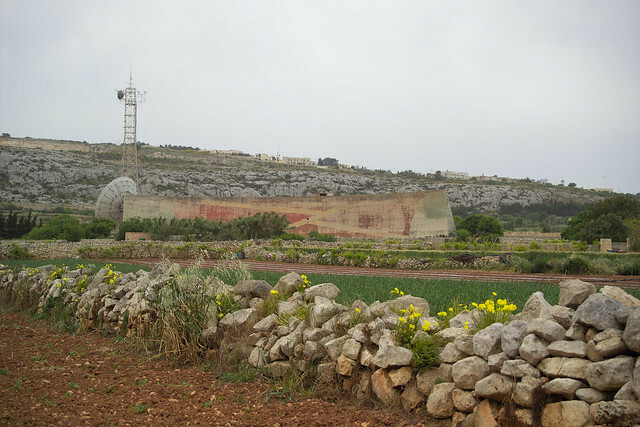 Whilst you are in Mgarr, take a look at the ‘egg church’ with it’s oval dome and the bomb shelter underneath the ‘Il Barri’ restaurant. One of the problems with combining several photos together is that you have to keep the camera AND the subject still. A tripod is very useful but not always essential as most software packages try to align the images. In this shot, taking in the evening in Kalkara, the water was calm but not 100% still so the boats did move a little between shots. I had to tidy it up a little in Photoshop to remove blurred edges and the like. 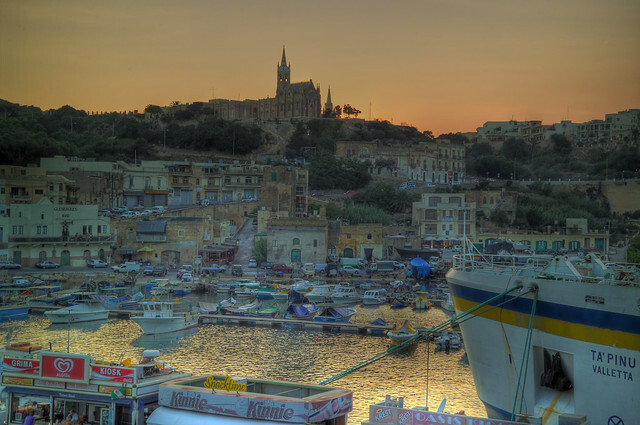 The sun had just disappeared over the hill behind Mgarr church when I took this picture from the deck of the Gozo ferry. I didn’t have my tripod handy but was able to balance the camera on one of the ships deck rails. 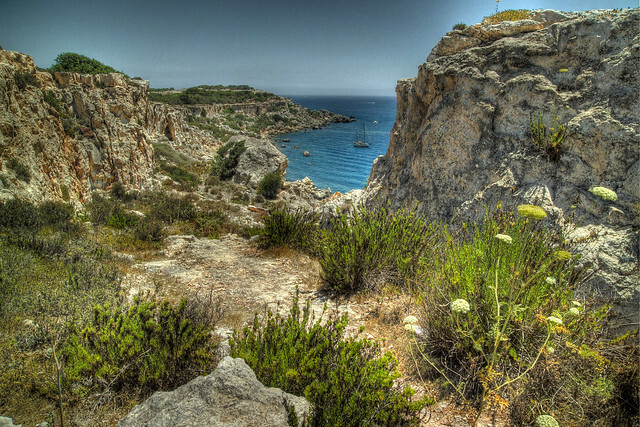 One of my favourite parts of Malta is the wild section of coastline between Migra iL Ferha and Ras id Dawwara. Here are a couple of winter sunsets taken a couple of years apart but within a few hundred meters of each other. 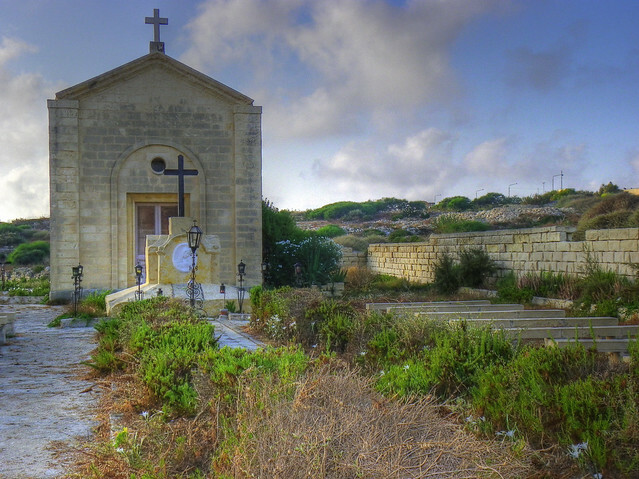 This tiny chapel and cemetary stands close to the entrance to the Mediterranean Film Studios. The remains of Cholera victims from nearby Kalkara were interred here. Nowadays it stands mostly forgotton between Fort Ricasoli and Fort Rinella (home of the Armstrong 100 ton gun). 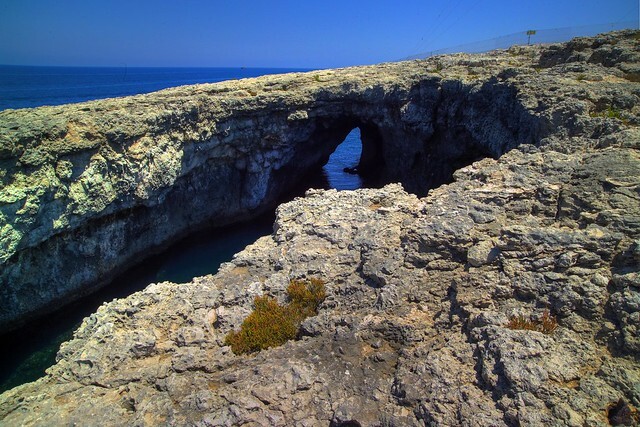 If you find yourself near Qrendi with a bit of time on your hands, the enormous sinkhole at il Maqluba is well worth a visit. The hole was formed in 1343 when the roof collapsed on a massive cave. It left a ‘Solution Subsidence Structure’ – a crater hundreds of feet across and between 40 and fifty metres deep. Il Maqluba is pretty well hidden so you are unlikely to come across it by accident. 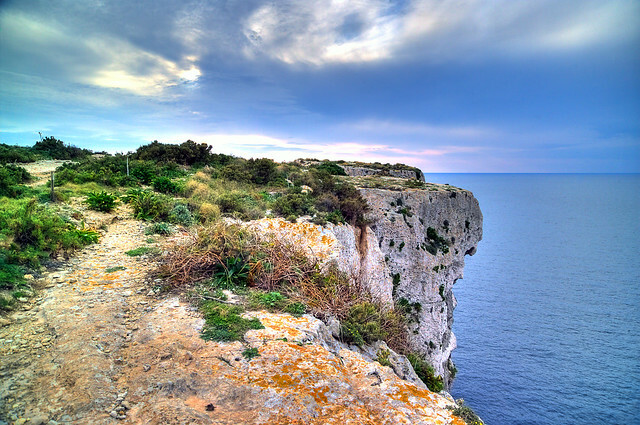 The easiest way is to follow Triq Il Tempesta – the road that leads to Qrendi from Mqabba and continue with Qrendi on your right side until you come to the chapel of Saint Matthew in a little square (more of a triangle actually). You will find an overgrown path leading to il Maqluba on the left side of the chapel. There is a simple observation area where you can look out over the crater. The bottom is covered with bamboo, sandarac gum, carob and pomegranate trees. Unfortunately, the last time I visited it was also covered with a certain amount of rubbish. 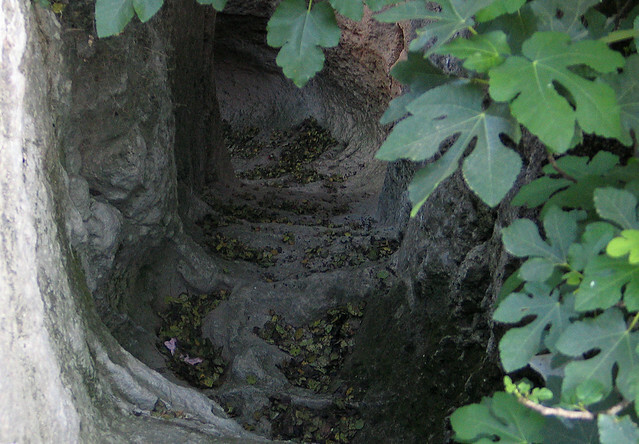 Partially hidden by a large wild fig tree, a set of rough hewn steps leads down towards the bottom of Maqluba. I am not sure who cut these stairs but I can think of at least four reasons not to use them. They are steep and worn and definitely not safe. After about 15 meters, the stairs are blocked by a fallen boulder. You can only pass by wriggling underneath this huge stone on your stomach. The steps do not go right to the bottom of the crater. You will have to clamber down the last couple of meters of rocks, ideally leaving a rope so that you can get back up. There is nothing to see at the bottom except rubbish and trees. The views are much better from the top. Maqluba really is at it’s most spectacular when seen from above but If you are still interested in what it looks like at the bottom, take a look at my short video of when I climbed down with two of my cousins’ hubands and a small dog in summer 2007. It was about 08.00 on a Sunday morning…. 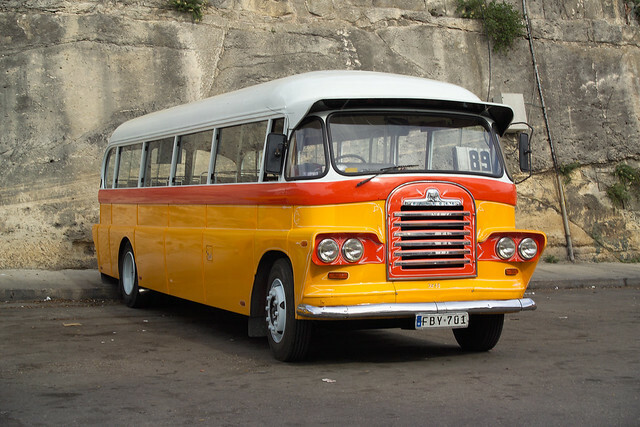 In 2011, the old style Malta buses were taken off the road and replaced by modern vehicles. Most of the old buses were scrapped, a few were sold, and about 100 of them were put into storage with the hope of showing them in a museum at some stage. A pre 2011 visit to Malta wouldn’t have been complete without a ride on one of the colourful buses. The routes radiated out like a star from the Valletta bus terminus, just outside the city gate. 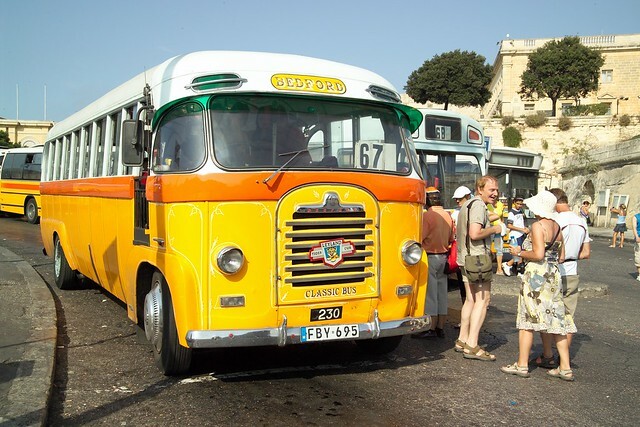 Until 1973 you could tell the destination of the bus just by looking at it’s colour – Sliema was green and white, Zabbar was red and white with a blue stripe etc. Check out Alan Edwards’ fascinating site for some more examples and a lot more historical information. Later, the buses all had numbers. For a while they were all painted green and white before the ‘final’ orange, yellow and white colour scheme pictured below. In their heyday, walking around the Triton fountain at the Valletta bus terminus and (ignoring the newer types) you would have found it very difficult to find two buses of exactly the same design. Most of them had locally built bodies which have been modified and customised over the years. The badges and emblems on the front of the buses carried names like Dodge, Leyland, Bedford etc. Real bus buffs (I do not count myself as one) would have recognised that these were there mainly for decorative reasons, and were seldom an acurate reflection of the vehicle’s origins. It used to be common to find an elaborate shrine or statue of a patron saint mounted in the drivers compartment. In later years you were equally likely to find football penants and the like decorating the cabs. Nowadays much more modern buses are to be found at the Floriana terminus. They are more environmentally friendly and possibly even more comfortable than the older types. Nevertheless, I miss the old buses. I remember when you boarded your bus, making sure that you had the correct change ready to pay the (usually) surly driver as you got on. If you were seated anywhere near the front, you would have noticed that most drivers sat well to the right of their steering wheel. The reason for this as any Maltese will tell you, was to leave space for their guardian angel to sit along side them. I wonder where the angel sits these days? As Europe tore itself apart during the second world war, Malta nudged it’s way into the record books as the most heavilly bombed place on earth. More bombs rained down on Malta in April 1942 alone that on London during the blitz. In the same month 6700 tons of bombs rained down on the island. By comparison, approximately 500 tons of high explosive are thought to have fallen in the devastating Coventry blitz of 1940. 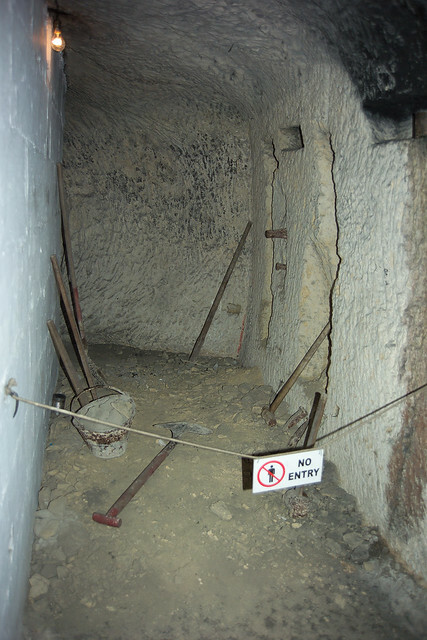 To avoid this hell, the people of Malta spent a large part of their life underground in an elaborate network of shelters. Some of which can be visited today. In the square in front of Mgarr’s impressive parish church is the “Il-Barri” restaurant. It has an excellent reputation for it’s traditional Maltese rabbit dishes but I had come to see the air raid shelter that is accessed through the back of the restaurant. I paid a modest 3 euro and was asked to wait a few minutes whilst the lights were switched on in the shelter. Then I was taken downstairs and was shown a newsreel film of Malta’s wartime privations. When the film was over we (me and one of the girls from the restaurant – I was the only visitor) passed through a door into the shelter itself. I was completely taken aback at the scale of what I saw. 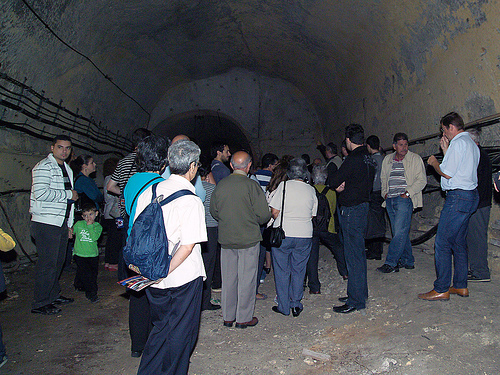 The tunnel extends more than 200 metres underneath the center of Mgarr and would have had multiple entrances (nine if I remember correctly). The tunnel twists and turns and there are recreations of first aid posts, family rooms and school classrooms in little rooms off the main tunnel. I asked my guide whether she was from Mgarr. She was – her grandmother had given birth to one of her children here in this dark damp place. 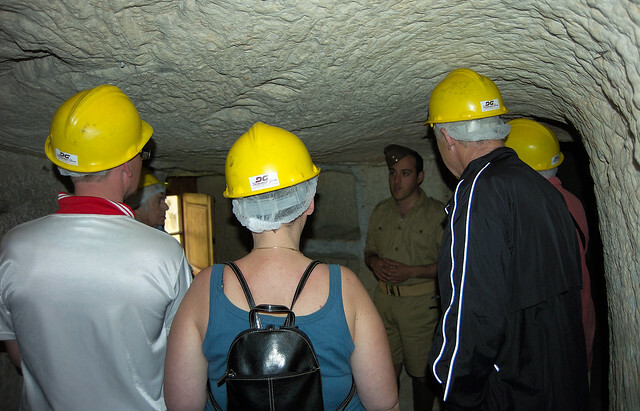 Another shelter that is open to the public can be found at the ‘Malta at War Museum’ close to the Couvre’ Porte gate in Vittoriosa. It is maintained by ‘ Wirtartna’, Malta’s Heritage Trust and when I visited, was staffed by two history students dressed in period military uniforms. After donning hairnets and safety helmets, we were lead underground through the gas proof (covered by a wet sack), blast proof (reinforced by a concrete lintel) door. 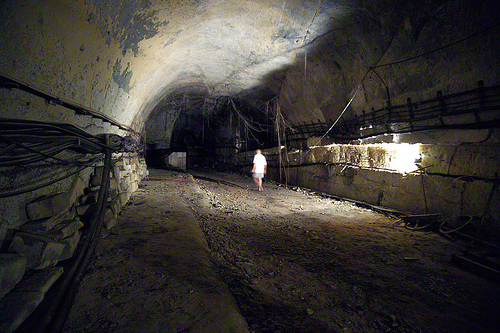 This shelter was one of about ninety under the city of Vittoriosa alone. Goodness knows what state the rest of them are in but the Couvre Porte shelter is in pretty good shape. Residents would have beed issued with a pass indicating which shelter they were to go to in the event of a raid. Of course, people were frequently in ‘the wrong place’ when an air raid started and they would be accomodated in the closest shelter. If it was full, they would make a dash to alternative an so on until space was found for them. The steep set of stairs leads from the museum entrance past an infirmary area and into the main accommodation area of the shelter. 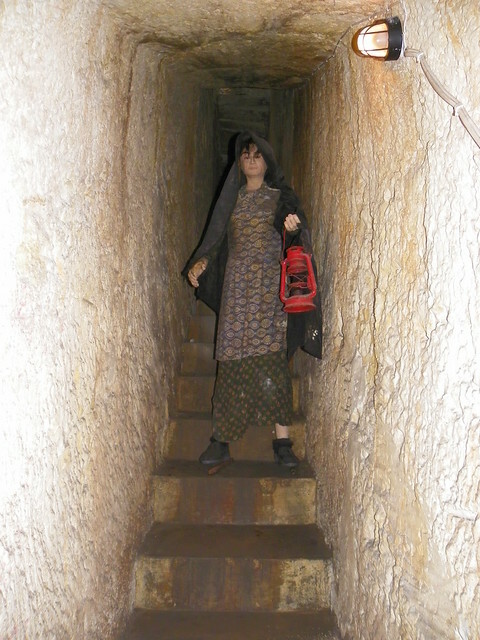 In this network of dark, damp, smelly passages, hundreds of people would wait for hours on end until the raids finished. 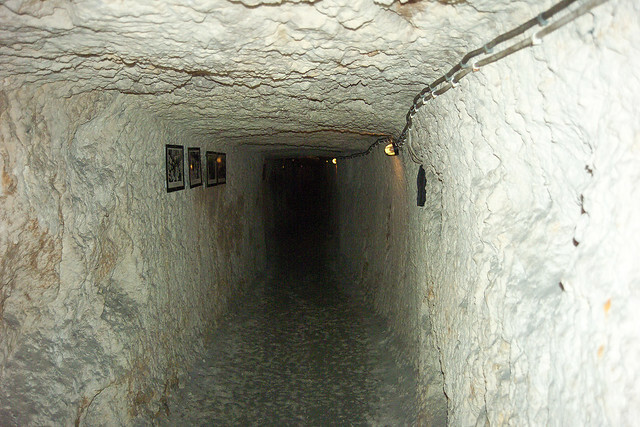 Today, the tunnels are lit by electric lamps but during the war there were no such luxuries. In niches cut into the rock, makeshift lamps burned olive oil and gave off a dim and smoky light. It must have smelled like a chip shop! Families could get a little bit of privacy by renting a tiny room off one of the main passages. The only catch is that they had to dig the room themselves out of the solid rock! Limestone is quite soft as rock goes but it must still have been quite an effort working for hours on end with a pick axe in those airless conditions. My dad remembers digging a room with his father in their shelter in the village of Tarxien. I would have thought that both smoking and spitting would have been consideres nuisances and that the first line would have been sufficient, even in the chaos of wartime Malta. Were the good people of Vittoriosa such heavy smokers and flambouyant spitters that these misdemeanors had to be called out separately? Talking of nuisances, image several hundred people gathered in one place for several hours with terrifying things happening all around them. The toilets would have been in quite some demand. The facilities in the shelter were rudimentary but adequate. 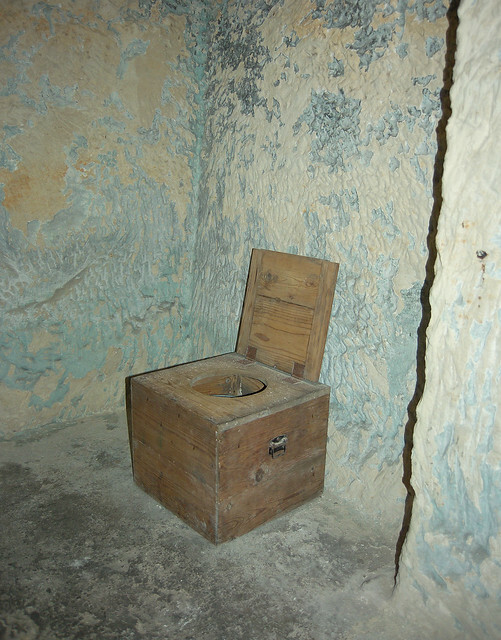 A small room, curtained off from the main tunnel contained two wooden lavatories opposite each other. One of the less enviable jobs of the shelter officials was to empty the toilets after each raid. In the National War Museum in Valletta, there used to be a small model of a sound locator or ‘acoustic mirror’. Constructed in the days before radar was invented, such mirrors were designed to reflect and focus the sounds of approaching aircraft so that their bearing could be calculated and an appropriate welcome organised. The Malta mirror is known as Il Widna – the ear, and was built in a location north of the town of Naxxar. I had looked for it on various visits to Malta over the years without success, and had pretty much forgotten about it until I came across Andrew Grantham’s interesting web site. This not only provided a detailed history of the mirror, but also it’s precise location shown on a google map! 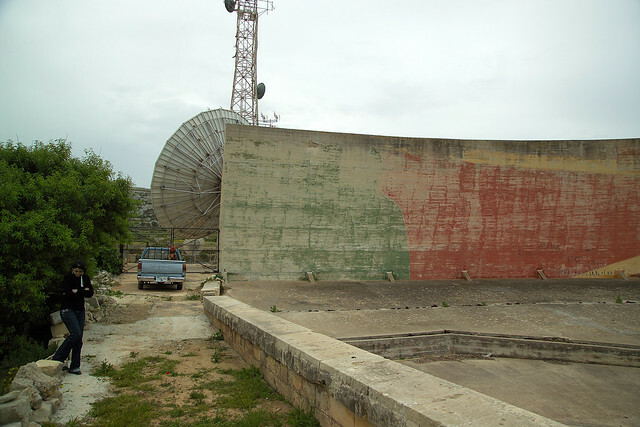 The mirror stands on the site of the Maghtab earth station, used by GO Malta for their digital TV operations. I was going to be in Malta for the last weekend in April 2009 so I sent GO Malta an e-mail asking whether they would mind me photographing the site and they replied almost immediately with an offer to let me look around. Since the first world war, British scientists had been experimenting with acoustic locators in one form or another. Early tests were made with scaled-up ear trumpets. Other fanciful proposals involved digging large arrays of pits where sentries would sit and listen for intruders. The plan was that, when an aircraft was heard, the operator would communicate the exact time of the event a central headquarters where by comparing reports from other pits, the track and speed of the aircraft could be calculated. Needless to say, further work was required to make a workable system. By 1930 the current state of the art was the ’strip mirror’. A prototype sound locator of this design was built at Denge in the UK, followed a couple of years later by the Maltese mirror. There were plans to construct similar mirrors at strategic sites throughout the empire including five covering all approaches to Malta. As it turned out, the Maghtab mirror was the only of these concrete curiosities built in Malta. It is also the only one outside the UK. The invention of radar quickly rendered sound locators obsolete. Il Widna is 200 feet from end to end and rises to a height of some 27 feet. In front of the wall is a sloping expanse of concrete and the ‘listening trench’ where 20 very sensitive microphones would have been located. The microphones were monitored, and their output was interpreted by operators in a small room at the back of the mirror. When the mirror was commissioned in December 1935 it had already proved to be effective in detecting incoming aircraft at a range of up to 36 miles. In other trials, 20 – 25 miles was more typical but planes were slower in those days and even from this shorter distance, would have taken a good 10 to 15 minutes to reach Malta’s coast. When I visited the mirror I found that you could get a perfectly good view of it across the fields from the public road. It is still painted in a camouflage scheme designed to make it difficult to spot from the air but from the ground it is very easy to see. Just look for GO Malta’s satellite dishes. A few years ago whilst fiddling around in Facebook, I came across a group called ‘The Malta Railway’ and was surprised to see that they had well over 1000 members! Not bad for a railway that has no tracks and hasn’t seen a train for over eighty years. I joined the group in the hope that I could find out a bit more about the remains of the railway system and particularly the tunnels at each end of the single track. See my earlier posts about the Malta railway here and here. The entrances to the tunnel between Valletta and Floriana have been blocked for many years by chained iron gates and limestone blocks. I have read messages on the internet from people who have managed to find ways into the tunnel and have been sorely tempted to give it a try myself but… that would be trespassing (and anyway, I am far too fat to squeeze through the railings). 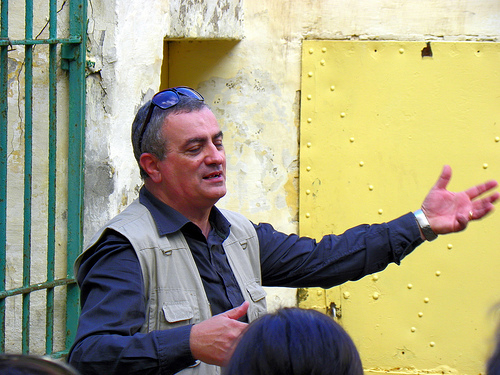 Imagine my delight one day in September when I read an announcement from the Facebook group’s admin – Paul Galea, that he would be leading tours of the tunnel and Floriana station on the 23rd of October 2011. I booked my flight to Malta immediately. 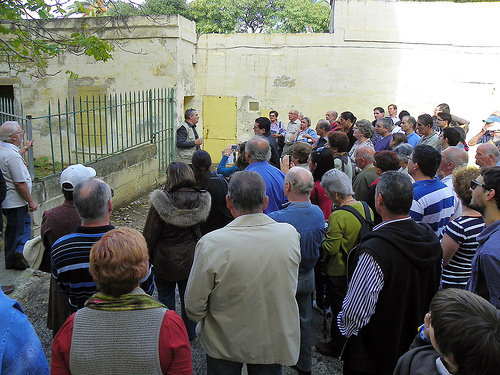 When I got to the Floriana local council building for the 10.00 tour there was already a large crowd of people waiting. They were not your usual train spotters – not an anorak in sight despite the damp October weather. First stop was the ticket office tucked away next to the Methodist Church. Here Paul Galea explained that the normal entrance to the station was via a door and a set of stairs that were now blocked off. We followed him down the ramps that offered alternative access and would have been reserved for military personel other ‘special cases’. As we made our way down towards the station level, it was clear that a great deal of debris and rubbish had been allowed to accumulate on the site over the last 80 years. It was also clear from the grafitti on the limestone walls that there had been a steady stream of ‘unofficial’ visitors to the station over the years. The station area itself had been provided with fairly bright temporary lighting powered by a portable generator. Originally the entire station area would have been lit by candles! Paul did a tremendous job explaining something of the history of the railway and of the station itself. 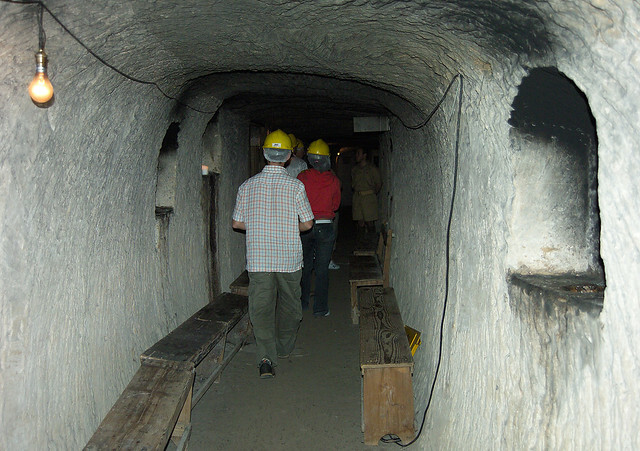 At one stage during the talk when covering the wartime use of the station as an air raid shelter, an elderly gentleman interupted and explained that as a 10 year old, he was one of those who lived and slept in the tunnel during the war years. 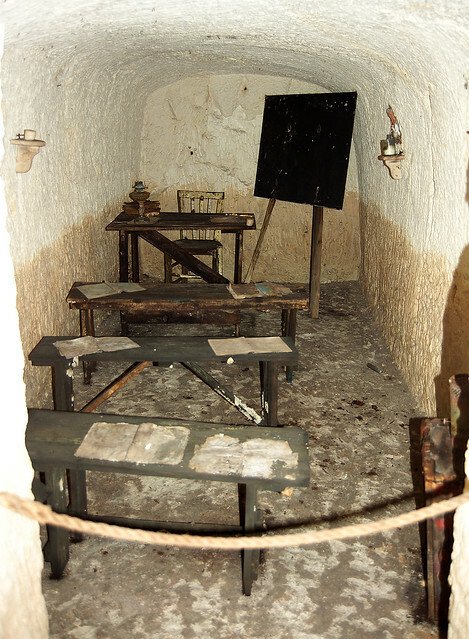 He told us how two rooms (behind the bricked up passage to the ticket office) were set aside as classrooms as teachers tried in vain to make their voices heard above the din of the people living in the tunnel. To be honest I am not much of a railway buff and this account of the station’s ‘human history’ was at least as interesting to me as the technical details of the steam trains and the rolling stock. Not part of the original equipment but nevertheless impossible to ignore were the huge bundles of high tension electricity and telephone cables. Paul explained that the parts of the tunnel that were not accessible to the public were strewn with discarded cable drums and other debris. If the station was ever to be returned to it’s original appearance it would be an enormous (and expensive) job to conceal these cables . Personally, I doubt that anyone would have an deep enough pockets for this sort of work BUT I would love to be proved wrong. After we had spent a while in the tunnel, we returned to the entrance and were shown the small magazine (with it’s own external access), which was used by the British military to guard the tunnel. It was from here also that ammunition could be loaded onto the train for transport to the Victoria Lines in the event of an invasion. Beyond the magazine, the railway enters another short tunnel before emerging in the Notre Dame ditch. This section is not currently accessible and houses the remains of the wartime telephone switching equipment. My thanks to Paul Galea and the Floriana local council for this unique opportunity to travel back in time. Perhaps one day we will see other parts of the Malta Railway opened to the public. I would love to walk underground from Floriana to Valletta or perhaps between Notabile and Museum Stations at the other end of the line!